Garage Door Installation: Reputation Matters In Our Business. With over thirty years of experience in garage door sales, installation, and service, at Brothers Garage Door we take great pride in our knowledge, expertise, and outstanding customer care. 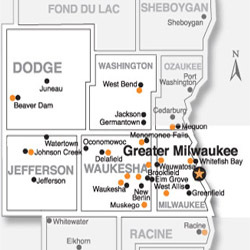 With locations in Waukesha and Washington counties we are ” Your Neighborhood Garage Door Company” ready to service your repair or replacement needs in SE Wisconsin. Having a garage door installed or replaced is no simple job–there are any number of things that could go wrong. Your garage door is usually the largest moving part in your home. It calls for a technician who has been properly trained according to industry standards, from a company that is fully bonded and insured. Garage doors come in many different shapes and sizes, and can be customized to suit your needs. For the Wisconsin climate, we find that steel doors are the most popular choice, due to their longevity and durability under harsh weather conditions. Steel doors do not warp or crack, like other doors sometimes do, yet they can be made to resemble other materials, such as wood. Whatever you decide on, be sure to check warranties carefully–they are not all the same. You’ll want to ensure that important parts (e.g., rollers, cables, springs, door panels, etc.) and certain types of damage (e.g., splitting, cracking, or warping) are sufficiently covered.